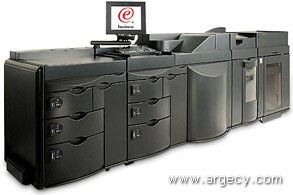 The IBM Infoprint 2000 is a high-end 110 page-per-minute (PPM) cut-sheet Production Publishing System. The IBM 2710 Model DP1 is a high speed cut sheet production publisher aimed at the data center environment where Xerox native data stream (LCDS/Metacode) is the predominant production datastream. As a network printer for large workgroups, production printer for ERP systems or systems printer in non-IBM environments. As both a standalone duplicator and network printer. As high speed channel attached data center printer with support for Xerox (LCDS/Metacode) datastreams. Large paper input capacity of 4,000 sheets standard. Finisher and stapling capability standard. High monthly print volumes, 2 million impressions per month maximum, 1.1 million impressions per month on average. Optional Network (Ethernet) and channel connectivity. A Standalone Full Function Duplicator. A High Speed Network Printer. Both a High Speed Network Printer and Full Function Duplicator. A High Speed Channel Attached Data Center Printer. A 110 PPM low-cost per copy digital duplicator. A finisher and optional booklet maker for complex duplication jobs. Pre-press level production scanning application. A high speed 110 PPM network printer. 600 dots-per-inch (DPI) printer quality. PCL 5/6 and PostScript level 3 support is standard. 10/100BaseT Ethernet connectivity is standard. A dual head stitcher is standard. Optional High Capacity Stacker, High Capacity Paper Feeder and Booklet Maker for complex print jobs. A high speed 110 PPM printer with an optional booklet maker. IBM S/390 Parallel Channel connectivity is available. 10/100BaseT Ethernet connectivity is available. Some models of the Infoprint 2000 can be configured as both a standalone duplicator and network printer with the benefits of both. In addition to the three base models, IBM offers Printer Solution Offerings (PSO) that contain all the features for certain customer applications and may be ordered as a bundled set at a lower cost than if ordered separately. The PSO is IBM's most price-competitive offering for popular customer applications. One PSO must be ordered with a RP1 or DP1 model at initial order. The Infoprint 2000 production publishing system is a high quality high speed cut sheet printing system. All models of the Infoprint 2000 with the network printer capability can be front-ended by Infoprint Manager or can be integrated into an existing Infoprint Manager (Version 3.1 at the appropriate service level) environment. Model RP1 -- High speed multifunctional digital duplicator with upgradable features to include network connectivity and is aimed at the corporate reprographics centers, in-plant print shops and the print for pay market. Model NP1 -- High speed PostScript, PCL, and PDF printer with upgradable features to include production copying capabilities and is aimed at the large office workgroup, and data center environments where PostScript and PCL are the predominant data streams (that is, ERP installations like PeopleSoft and SAP as well as non-IBM data center environments). Model DP1 -- High speed cut sheet production publisher aimed at the data center environment where Xerox native data stream (LCDS/Metacode) is the predominant production datastream. A modem for remote diagnostics (only on 60 Hz machines). In addition to the three base models, there are PSOs available for some models. A PSO includes several features bundled together for a specific application. The PSO is IBM's most price-competitive offering for a specific application. Model RP1 has two PSOs associated with it. One of these PSOs (but not both) must be ordered with the initial order. Standalone Duplicator Solution (feature #4210). Network Publisher Solution (feature #4220). The Standalone Digital Duplicator Solution is intended for reprographics centers and print shop applications. This feature includes all microcode needed for the Standalone Digital Duplicator application. The Network Publisher Solution is intended for corporate reprographics centers where an attachment to the corporate network is required. This feature includes all microcode for duplicator printer functions, and also includes the LAN connect capability. Model NP1 is itself a complete solution and therefore doesn't have any PSOs associated with it. Model DP1 has one PSO associated with it. This PSO must be ordered with the initial order. Xerox Datastream Solution (feature #4230). The Xerox Datastream Solution is intended for corporate data center applications. This feature includes an SCS, 512 MB memory, network connectivity, channel connectivity hardware, Xerox Native Datastream (LCDS/Metacode) enablement and all microcode needed for a network printer and data center application. In addition to these options, the NP1 can have an optional scan station (standard with the RP1). The scan station includes an up to 20 PPM scanner with 600 DPI resolution and a SCSI card. The scan station requires a Windows NT workstation that must be ordered separately. Refer to the IBM Web site at http://www.printers.ibm.com/ for the Windows NT PC that is a prerequisite for the scan station. Note: The Infoprint 2000 scan station has been tested and qualified on the listed PC configurations only. IBM service cannot install or service Infoprint 2000 software running on configurations which are not qualified. 512 MB of memory standard for storing digital images (included with PSO for DP1). Below is a list of optional features that can ordered for any of the three models. In addition to these options, the NP1 and RP1 model can have one scanning station (it comes standard on the RP1 model). Paper Supply Module 45.0 inches 33.5 inches 31.0 inches 545 lbs. Printing Engine 64.0 inches 47.0 inches 67.0 inches 1500 lbs. Finisher 61.5 inches 34.0 inches 22.0 inches 650 lbs. Stacker 49.5 inches 31.6 inches 33.0 inches 450 lbs. Signature Booklet Maker 58.0 inches 24.0 inches 62.0 inches 970 lbs. Scan Station 10.8 inches 24.0 inches 30.0 inches 74.5 lbs. SCS Cart Assembly 25.0 inches 28.0 inches 12.0 inches 55 lbs. An English keyboard is the default keyboard for both the Controller keyboard and the Scan Station Keyboard. No specify code is required for an English keyboard. VOLTAGE: A specify code is not required. Voltage/power will be determined by the plant based on the country code of the order. Prerequisites: Infoprint 2000 Model DP1. Maximum Number of Features: One per Infoprint 2000 Model DP1. Corequisites: The 4th Infoprint 4000 attached to the same host requires FN 4110 in addition to this feature. Compatibility Conflicts: Cannot be installed with FN 4230, 4240, or 4233. Field Installable: No. Initial Order: Yes. Cable Orders: None. Prerequisites: Infoprint 2000 Model DP1 that is the first printer attached by TCP/IP and RJE. Maximum Number of Features: One per Infoprint 2000 Model DP1. Corequisites: None. Compatibility Conflicts: Cannot be installed with FN 4230, 4240, or 4232. Field Installable: No. Initial Order: Yes. Cable Orders: None. Prerequisites: Infoprint 2000 Model DP1. Maximum Number of Features: One per Infoprint 2000 Model DP1. Corequisites: None. Compatibility Conflicts: Cannot be installed with FN 4230, 4232, or 4233. Field Installable: No. Initial Order: Yes. Cable Orders: None. A maximum of one additional paper supply module can be added per printer. It is identical to the standard one. The stacker has two access buttons. Top button: partially lowers tray and allows to remove finished sets. Bottom button: completely lowers tray and allows the dolly to transport large quantity of finished sets. Additional stacker dollys may be purchased. The booklet maker is an optional output device that creates a booklet by saddlefolding and stapling supported paper sizes. The booklet maker requires the High Capacity Stacker (Feature 4620/4621) as a prequisite in order to rotate paper from long-edge feed to short-edge feed. A maximum of one booklet maker can be added per printer. A conveyor belt delivers the finished documents from the booklet maker. The interval width between booklets can be adjusted via the OCI and/or printer drivers. The conveyor belt can accept up to 42 booklets (10 sheets, 80 gsm) and when not in use can be dropped at a 90-degree angle to free up space. The booklet maker includes a trimmer. It allows trimming of the open edge of folded booklets and is usually required when the number of folded sheets is 10 or more. The trim length is adjustable up to 10 mm. One scan station comes standard with the RP1 model. It consists of an up to 20 PPM scanner with 600 DPI resolution and a SCSI card. The scan station requires a PC running Windows NT which is NOT included in the scan station feature and must be ordered separately. The Windows NT PC is connected to the controller via Ethernet. A maximum of one scan station is supported per printer. When this feature is installed on the model NP1, then, FN 4289 (printer to printer/duplicator ucode upgrade) is a prerequisite. Scan rate of 20 ppm at 600 DPI in simplex mode, slightly less in duplex mode. Accepts up to 50 sheets (up to 8.5 x 14 inch 20 lb. Stock). Accepts up to 20 sheets (11 x 17 inch 20 lb. Stock). Refer to the IBM website at w3domino.penn.boulder.ibm.com/sales for the Windows NT PC which is a prerequisite for this feature. Note: The Infoprint 2000 scan station has been tested and qualified on the listed PC configurations only. IBM service cannot install or service Infoprint 2000 software running on configurations which are not qualified. The network connectivity option uses a 10/100BaseT Ethernet Network Interface Card (NIC) with a RJ-45 jack. A maximum of one of these features is allowed per printer. Network protocol support includes TCP/IP, Appletalk, Ethernet, IPX/SPX. The channel connectivity option includes a channel controller standalone unit. It has connectors for channel Tag and Bus cables (cables must be ordered separately) for a connection to an IBM S/390 parallel channel. A maximum of one of these features is allowed per printer. The Xerox datastream enablement includes software to convert the Xerox native data stream (LCDS/Metacode) to PostScript level 3. Included with this option is the software and installation. A maximum of one of these features is allowed per printer. This feature is only available as a MES on the RP1 model. It provides the microcode for an RP1 model with the Standalone Duplicator PSO (feature 4210) to add printer capability. Network Connectivity (feature 4160 or 4161) must be ordered as a corequisite. A maximum of one of these features is allowed per printer. When FN 4287 is ordered for the Model RP1, FN 4210 (standalone duplicator PSO) is a prerequisite, and either FN 4160 or FN 4161 (LAN connect) is also a prerequisite. This feature is only available as a MES on the NP1 model. It provides the microcode for a NP1 model to be upgraded from a printer only to a Printer/Duplicator. The Scan Station (feature 4290 or 4291) must be ordered as a corequisite. A maximum of one of these features is allowed per printer. This kit includes all hardware to vent heat from the Infoprint 2000 to the outside. A maximum of one of these features is allowed per printer. This includes an additional dolly used with the stacker to move large print jobs easily without the risk of papers falling. There is no maximum number of stacker dollys allowed per printer. Lexmark International Inc. markets IBM Infoprint 2000 supplies. Supplies can be purchased from Lexmark Authorized Supplies Dealers or in the U.S. from Lexmark Telemarketing Operations. Lexmark Telemarketing Operations can also provide information about the nearest Lexmark Authorized Supplies Dealer. stock of supplies. It is recommended that customers maintain a two-to-three month stock of supplies on hand.